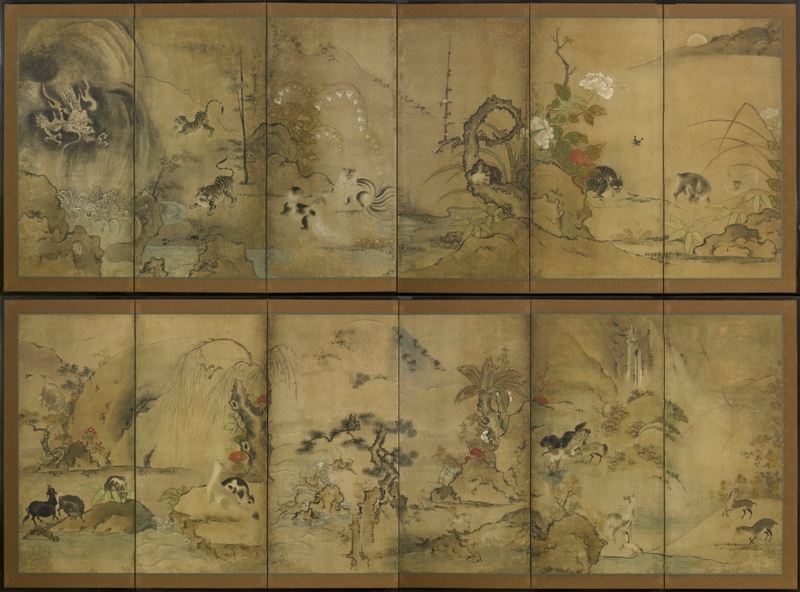 7303 A six- fold paper screen painted in ink and colour on a silver ground with momiji (maple) in autumn. The tree growing from a rocky outcrop beside a waterfall. Momiji (maple) shares pride of place with sakura (cherry blossom) as the two most important seasonal symbols in Japan. This much admired autumnal motif is mentioned in the Manyōshū (Collection of Ten Thousand Leaves), Nara period (645-781); the literary masterpiece Genji Monogatari (The Tale of Genji) from the Heian period (782-1184); and the popular Noh play Momiji-gari (Maple Viewing) of the Muromachi period (1392-1572). SKU: 7303. Categories: Screens, Six Fold.